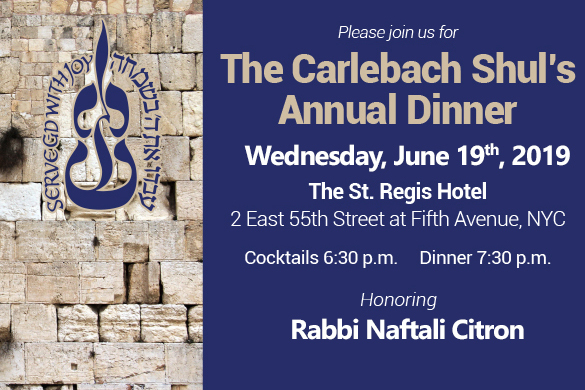 The Carlebach Shul’s Seventeenth Annual Gala Dinner and Scroll of Honor Wednesday, June 19, 2019 Cocktails 6:30 p.m. Dinner 7:30 p.m. 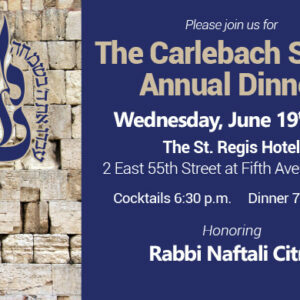 The St. Regis New York , 2 E. 55th Street at 5th Avenue The Carlebach Shul hosts a yearly dinner where members of the Shul are recognized for their commitment and dedication to our Shul and the community at large. As a major fundraiser for the Shul, this dinner enables us to continue running our many different programs and events. Cocktails 6:30 p.m. Dinner 7:30 p.m. The Carlebach Shul hosts a yearly dinner where members of the Shul are recognized for their commitment and dedication to our Shul and the community at large. As a major fundraiser for the Shul, this dinner enables us to continue running our many different programs and events. The uniqueness of The Carlebach Shul lies in its ability to bring together and inspire a wide spectrum of the Jewish population. The unaffiliated Jew, the modern-orthodox, the traditional Chassid, as well as a host of Scholars-In-Residence all come to pray, sing, dance and learn together in an environment that embodies holiness, spirituality and joy.